100 Years 1950s-1990s Teacup & Saucer Set features. Crafted from fine bone china. Decorated with a polished gold-plated trim. Beautifully presented as a set of five teacups and five saucers in a Royal Albert gift box. 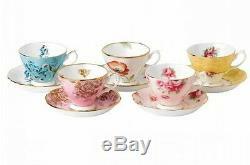 The item "NEW Royal Albert 100 Years 10 Piece Tea Cup & Saucer Set 1950-1990" is in sale since Thursday, September 21, 2017. This item is in the category "Home & Garden\Kitchen, Dining, Bar\Dinnerware\Cups & Saucers". The seller is "dontrueblue" and is located in Sydney, NSW. This item can be shipped worldwide.